The city of Rotterdam, De Verre Bergen Foundation and Museum Boijmans Van Beuningen and MVRDV presented the design for the new Collection Building on the 8th of March 2014. The building with a surface of 15.000 sqm is an open art depot featuring exhibition halls, a sculpture roof garden and a restaurant. The public can see what’s going on behind the scenes in a museum and private art collectors will be able to store their own collection in ideal Museum conditions. 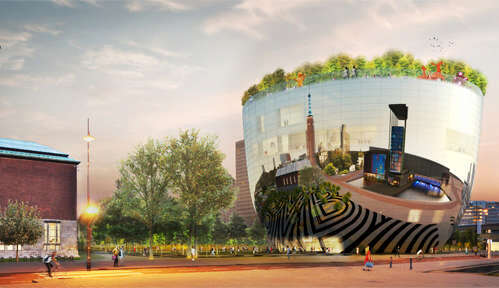 The design – a reflective round volume – responds to its surroundings, Rotterdam’s Museumpark in which it will be completed in 2017. The allocated budget is 50 million Euro. Collection Building is an art depot open to the public. A public route zigzags through the building, from the lobby on the ground floor where a café can be found up to an exhibition space, sculpture garden and restaurant on the roof. On the way up the route passes along and through art depots and restoration workshops. In depots visible from the route, the exhibition can be changed on a daily basis by simply moving storage racks so each visit to the building can offer a unique experience. 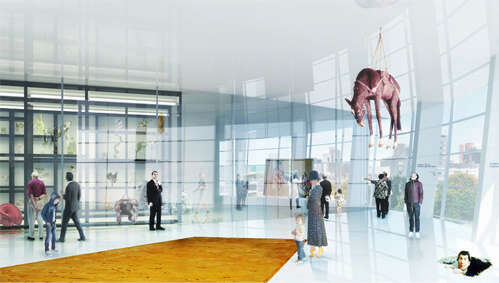 On three floors the route passes through exhibition spaces which will be programmed by Museum Boijmans Van Beuningen. The building – which will store the precious art collection of Rotterdam – will also have spaces not accessible to the general public. For example logistics, quarantine and room for private art collections whose owners can visit their art and even enjoy it in private spaces comparable to the art-equivalent of a sky box. This is a new commercial service offered by the museum. Additionally depots and an office of philanthropic foundation De Verre Bergen will be located in the Collection Building. The roof featuring a restaurant, sculpture garden and exhibition space offers wide views over Rotterdam and will be the new home for the Futuro, the ufo-shaped house of Finish architect Matti Suuronen. The Collection Building will be realised on the northern edge of Rotterdams Museumpark, realised by OMA with Yves Brunier in 1994. In order to spare the park, the volume is designed as a compact round volume with a small footprint and will be clad with a reflective glass façade. This will make the building less visible and allow reflections, the public can see what is happening elsewhere in the park. Where needed the reflection will be lesser for transparency and to avoid unwanted light effects. 40% of the 15.000m2 will be visible or accessible to the public. The building will feature seven different climatic conditions facilitating ideal conditions for art storage, offices and the public. The ambition is to reach sustainability classification BREEAM Excellent. In the autumn of 2013 five architecture teams presented their designs for the Collection Building in a competition won by MVRDV. The other contenders were Koen Van Velsen, Harry Gugger with Barcode Architects, Neutelings Riedijk and Mad with NIO. MVRDV was disqualified from the competition after an alleged breach of the regulations but was vindicated in a legal procedure and declared official winner. 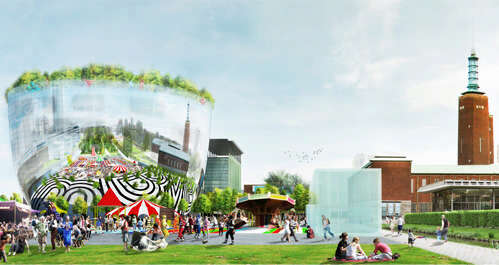 MVRDV won the competition together with Pieters Bouwtechniek, IGG Consultants and DGMR Consultants. Expected completion is envisioned for 2017.